I remember the exact time and place when my world fell apart – I was 16 in a car with my mum and she told me she’d found a “lump”. In one fell swoop my centre of gravity stopped revolving around me in my life as a selfish teenager as it dawned on me how important this special woman was to me, and tried to contemplate what these words would mean. I had a happy upbringing growing up in the countryside – I am the youngest of three children – the only girl with a gap of seven years between me and my next brother, and I think it would be fair to say I was allowed to get away with much more than my older brothers! I was most definitely a tomboy, far more into wrestling than playing with Barbies so my Mum was usually only acting as a referee when I pushed a brother too far and got a punishment in return. Due to the age gap though I spent most of my teenage years feeling like an only child as my brothers had headed off to University – I am ashamed to admit that I was pretty unpleasant to my mum as a teenager. I wanted her to argue back when I was being obnoxious, and tell me off, but she was a constant in the background – the calming influence, and I don’t remember her ever raising her voice to me. It was only when I reached my 20s that I could appreciate the strength of her personality and how difficult it must have been for her to bite her tongue. The only similarity with my mum’s own upbringing was that she also had 2 brothers – however her Mum had died when she was 6 and had been separated from her brothers during World War 2. From what I have latterly been told, her father did not treat her well, and I can understand why Mum did not find having a daughter easy – we had none of the girly chats that my school friends seemed to share with their Mums and my Mum seemed to spend most of my teenage years trying to avoid any awkward conversations and protect me from the real world including bad news about her health. I think I was emotionally totally unprepared to deal with her breast cancer, and spent a lot of time initially trying to be strong for her and protect her from my own tears. 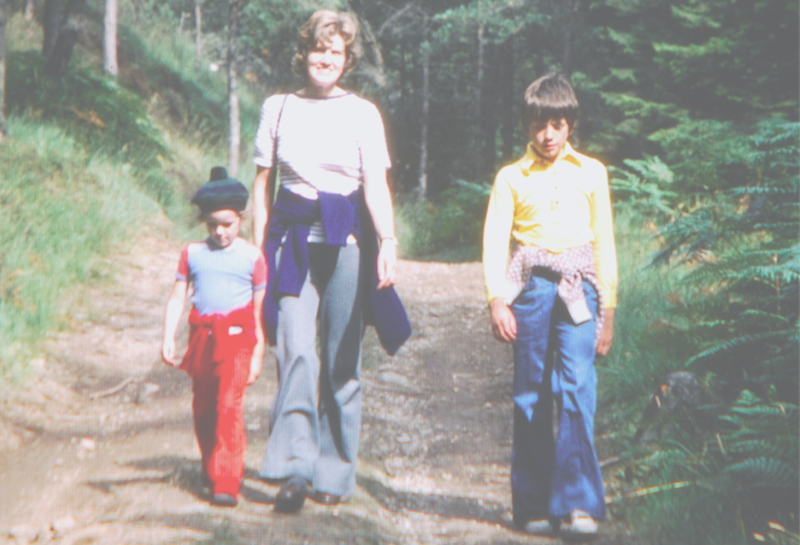 Cancer is a great leveller and made me realise what was important – not about the latest fashions or whether my mum was embarrassing me, but how much I really loved her and how irreplaceable she was. After my mum was diagnosed and had a mastectomy and radiotherapy she went into remission, which gave us all hope that it wouldn’t return. In those years before it returned I had grown up considerably and was able to have the best relationship with my Mum that I could have wished for; although Cancer is a horrible disease it did give us the opportunity to talk at a deeper level before she passed away, something that I wouldn’t have been able to do if it had happened suddenly. I lost my mum just over 20 years ago when I was 24 years old and she had just turned 60 – a long time before I even considered having children, and was busy trying to establish a career having left university the year before. At this age I was more concerned with not getting pregnant, rather than thinking of the future implications would be like when I had a family of my own. When mum passed away I was totally shocked and bereft – heartbroken is not too strong a word to use. My dad was far worse though, and the immediate concerns were to make sure he was OK and taking care of himself. It was a strange time, as the role of parent-child reversed and myself and my brothers found ourselves trying to look after our dad, who had gone from having a quintessential stiff upper lip to someone, quite naturally, struggling with his own grief. It was only when I returned from my visits to see him that I could allow myself to weep. When I first got pregnant I was very excited and focussed on the journey that lay ahead. However, I was adamant that I didn’t want my partner’s mum or step mum to try and tell me what to do or offer the advice that I thought only my mum had the right to give me. No one could replace her and I would rather have gone without any support from the next generation than feel that someone could step into her shoes. I saw our first child as a new beginning, a new generation, and tried not to allow the absence of my own Mum to spoil the excitement. I can see now that I made life harder for myself, rejecting support to try and prove something. I was so used to being independent that I thought asking anyone for help was a sign of weakness; the lack of control imposed on me by my newborn/toddler was hard to deal with, and I will freely admit I struggled to cope with the new demands. I was, and still am, sad that my boys would never know the lady who brought me into the world, and forms part of who I am. I think I am a lot more demonstrative towards my children than my parents were towards me and give lots of hugs. I don’t know if it’s a generational trait or if it’s something that happened subconsciously. I definitely tell my boys that I love them more frequently than I was told as a child. Although I know I was loved as a child, one of the first occasions that I remember my mum saying those words to me was when she was about to go into hospital for her mastectomy, which made me worry infinitely more that she wasn’t coming back. I want my boys to hear “I love you” in both good and bad times. I do occasionally think that I should write my children a letter to be “opened in case of emergency” when they’re 18, just in case I’m not around to tell them how proud I am of them, and try and pass on some wise words to help them into adulthood. I haven’t got round to doing this though, as I’m not sure if it would be tempting fate and also knowing where to start – I can’t envisage what my children will be like when they reach 18 but live in hope that I’ll still around to see them turn into men. I think that as you get older, and have your own children, you get a much keener sense of your own mortality, and having lost my Mum at a relatively young age leads me to believe that I may not be alive to see the arrival of any Grandchildren. I can still easily get upset when thinking about her if I allow myself to, and she is ever present in the background in my thoughts. Most of the time though, it is more the sense of missing her and just wishing things could be different. There are occasions which are more sad for me – Mothers Day is a particularly bittersweet event when I miss her most and would love to be sending her a bunch of flowers or taking her grandchildren to see her. As my Dad lives a long distance away I don’t have the constant reminder of my Mum’s absence, which helps. We are also reliant on “paid for” care for the children – school clubs etc, as neither of us have family on the doorstep to provide extra childcare. When someone dies they are permanently immortalised at the age that they’ve died at and it’s very easy to have an idealistic view of what life would be like if they were still alive. My Mum would have turned 80 now, but in my mind she would have been a 60 year old playing with my boys. I have to remind myself that I have no idea of what sort of role she would be able to fulfil in our family life if she were still here. My mum seemed to take parenthood in her stride, and I believe that I have struggled more with it and just going with the flow. I work and feel that I don’t particularly well at either aspect, torn between the two. I miss talking to my mum about the little things and just chatting, a very underestimated pastime. I know that she would have always been my biggest supporter and put my mind to rest that I am doing a good job. I am very lucky to have a sister in law who I have known since I was 16 who is like a big sister to me; I can talk to her about anything so she has stepped into the maternal role for me. I have also learned to not be afraid to ask for help and have some good friends with a great ability to listen! The memories I have of my mum that are most special are also the least dramatic – I used to love being given the responsibility of making us lunch (for just the two of us) when I was young. I used to rustle up my speciality; fried potatoes, cucumber and Mattesson Garlic Sausage (I grew up in the 70s) which she always seemed to enjoy and never grew tired of. It was the independence of helping look after her for a change. As I got older my fond memories became more of the fits of giggles we would share, usually over nothing significant, that would leave us with tears running down our face – it’s the simple things that matter. Helena lives in Leeds, UK, with her partner, Andy, and their two sons, Jack, aged 9, and Toby, aged 5. Keeping Mum is a online space where motherless mums can share stories, thoughts and general musings about navigating the endlessly winding path of motherhood without their own mums in their lives. "Grief is never chosen, but it can give you gifts, if you choose to find them." While we are more than happy for you to share these stories on social media, please do not re-post entire stories or features online, or in print, without asking our permission first. Copyright © 2017 Keeping Mum.